Confession: We are not role models for healthy eating. Healthy appetites? Definitely! But healthy eating, well...we're working on it. For one thing, we're trying out healthier ways to make traditional Armenian food. Consider that a pound of cooked, ground lamb has about 886 calories and 61.5 grams of fat. The same amount of ground turkey breast has about 640 calories and only 32 grams of fat. That's a whopping difference! We decided to try making turkey dolma. The big question for us was whether half the taste would disappear along with half the fat? Luckily, in our humble judgment, it tasted great. We'll eat just about any vegetable in this dish, but we happened to have a fresh batch of Romaine lettuce, one of our all-time favorites. It's easier to prepare than coring eggplant or squash -- you just simmer the leaves in water for a few minutes until soft -- and it's a wonderful substitute for grape leaves, which aren't always handy. And as lettuce goes, Romaine is a hands-down choice over iceburg, with lots more fiber, calcium, Vitamin C and lutein (one of those good things found in green, leafy vegetables). Finally, to make us feel almost too healthy, we use bulgur in the stuffing rather than rice. We love it, but we'll leave that up to you. Why not give this a try and let us know what you think? Separate the lettuce leaves and simmer a few leaves at a time in a large pot with just enough lightly salted water to cover the leaves. Remove the leaves, pat them dry and set them aside. Note: This is enough stuffing for about 2 dozen dolmas, but the yield depends on the size of the leaves. If you run short of lettuce, you can just roll the remaining stuffing into meatballs and cook them along with the wraps. Using a stable cutting board, trim the hard stems off the leaves. Place about a tablespoon in the center of each leaf (more or less depending on the size of the leaf) and roll as you would grape leaves -- that is, tucking in the sides as you roll. Place each wrap gently in the sauce. Add enough water to cover them. 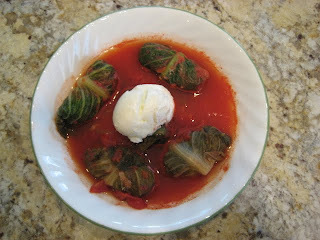 Then place a dish on top of the wraps and anchor the dish with a small pot of water or a heavy-enough object to keep the dolma from unwrapping as it cooks. Simmer for about half an hour. Serve with cold yogurt. I have never cooked romaine lettuce. Didn't realize you could! I can't wait to use them instead of expensive, hard-to-find grape leaves. This recipe sounds wonderful.